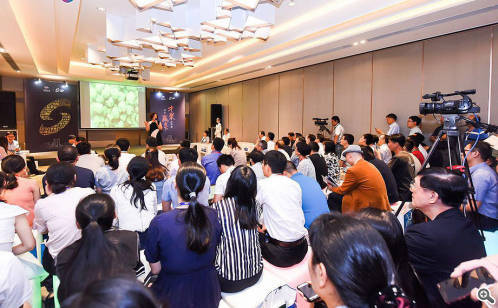 The three-day 2018 (10th) Venture Week for International Elites (VWIE) kicked off in Suzhou on July 10, attracting a host of domestic and overseas high-tech professionals and businesses with their new projects, including those recommended by SIP Jinji Lake Roadshow Center (SIP-JLRC). SIP-JLRC has been providing excellent financing and partnering services for business startups since its founding early this year. Thanks to its elaborate organization, four SIP enterprises engaged in bio-medicine and artificial intelligence gave all-around presentations on their projects at the event. "Our products based on big data and cloud computing technologies can help students identify their strong and weak points in study so that they can adjust their learning plans in time," Li Wenjian, founder of an education technology company, said when introducing their products. Moreover, SIP-JLRC is offering on-site services to allow individuals and companies to make registration for their projects to seek partners. Concurrently, SIP-JLRC is holding a project exhibition at Suzhou W Hotel, where the visitors have the chance to get close to the latest technological inventions in SIP.